Ehrhardt will be hosting a Black History program on February 28, 2019. 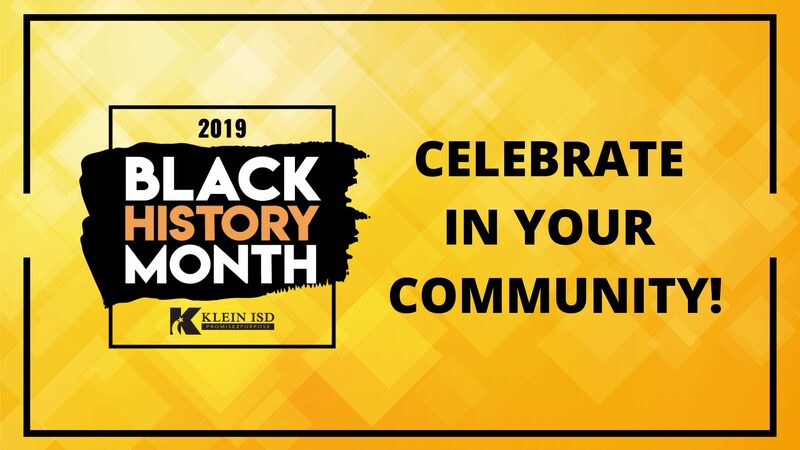 Klein Intermediate is hosting their Black History program on February 28, 2019. Houston also has tons of events and attractions to honor Black History during the month of February. Below are a few ways in which students and families can participate in the Houston area. There is always free admission to the museum on Thursdays from 1 to 5 pm, but there is a special event on Saturday February 16th. The 1st annual Afro Renaissance Festival is a Black History Month/ Houston Rodeo event which will showcase Black American culture through the celebration of Black American music, art, food, film, history and, technology. Open Wednesday to Saturday. Admission is always free. Visit this museum to explore the culture of Africans and African Americans through discovery-driven learning. On February 3rd and 10th, the Church Without Walls is hosting The Living Museum – a Black History showcase fit for the entire family! Live actors will be portraying historical African Americans between services. Historical artifacts will also be on display. We hope you take the time this month to attend an event in your community to celebrate Black History Month.